The WWE title has changed hands 5 times so far in 2010, with 4 different guys holding it (Sheamus, John Cena, Batista, and Randy Orton). The world heavyweight championship has changed hands 4 times this year. Five different men wore that belt in 2010 (Undertaker, Chris Jericho, Jack Swagger, Rey Mysterio, and Kane) I'm not going to get into the debate of frequent title changes in this post. Instead, I'm turning back the hands of time to the 1980's and 90's and looking at 5 guys who I think should have been world champion in the WWF. I realize two guys on the list were world champs elsewhere, but I'm focusing on guys during their time in the WWF. I struggled with this list. It was hard to narrow it down to just five. If the E hot potatoed (a new word) the title back then like they do today, I think these guys would have been world champion at some point. For the record, all these pictures are courtesy World Wrestling Entertainment. 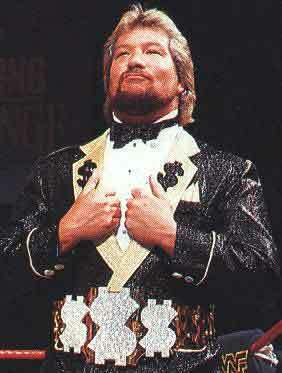 "The Million Dollar Man" Ted DiBiase was probably too early when he arrived in the WWF. He had all the tools. He would work in the ring and on the mic. He was one of the best pure wrestlers in the late 80's to come through the company. Ted DiBiase tried to buy his way to the title with his gimmick. Of course, that didn't work out and resulted in the infamous world title tournament at Wrestlemania 4. DiBiase it seemed had the tourney in his pocket, earning a victory of Jim Duggan and Don Muraco, and then drawing a bye into the finals. But remember, this was the 80's and Vince was still all about the babyface champion that he could market. Kids weren't likely to buy as many Ted DiBiase dolls, shirts, and foam fingers as they were say "Macho Man" Randy Savage. And that's not a knock at Savage, he was an excellent wrestler and a worthy champion. That tournament was probably Ted's best shot at the gold. He wrestled Savage off and on following that and had some title matches with the Ultimate Warrior a few years later, but came up short. He eventually created his own title, the Million Dollar belt. To his credit, he and IRS won the world tag team titles a couple of times. Mr. Perfect wasn't totally perfect. After all, Curt Hennig came up short in his quest for the WWF world title. But Hennig was the AWA world champion. When Hennig came to the WWF in 1988, he had a big time push, staying undefeated for quite some time. He's another guy who was a great worker and excellent heel, but he was in the WWF at a time when Hulk Hogan and other babyface champions (Randy Savage and the Ultimate Warrior) were dominating the scene. Hennig had some great house show matches with Hogan (or so I've read), sometimes winning by countout or disqualification. But he never reached that brass ring, or gold belt in this case. Mr. Perfect instead played second fiddle winning the Intercontinental title on two occasions. He also served as the "advisor" for multi time world champion Ric Flair. Now that Curt's son, Joe (aka Michael McGillicutty) is in the WWE, maybe he'll be able to do what his father couldn't. Again, in a different era, I have no doubt Mr. Perfect would have "been the man." 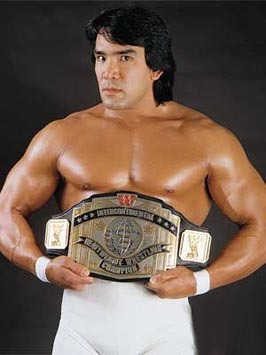 Ricky "the Dragon" Steamboat is another man who held the world title elsewhere. He had a brief reign as champion in the NWA/WCW in 1989. But I always thought the Dragon should have had a run in the WWF too. Steamboat had the opposite problem of Mr. Perfect and Ted DiBiase. He was a babyface. And as popular as he was, he wasn't as popular as Hulk Hogan and Randy Savage. Another thing that likely held Steamboat back was his size. Think back to the 1980's and early 90's. 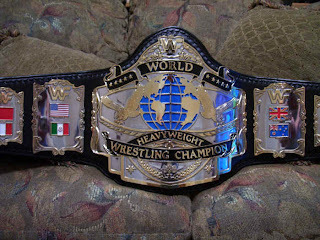 Who were your WWF champions? Hulk Hogan, Randy Savage, and the Ultimate Warrior. Literally from 1984 until 1991 these three men were the only ones to hold the belt. (I don't count Andre's 30 second reign in here). He wasn't a pumped up freak of nature. (Not that Savage really was either, but you get the picture) Heck, I would have even enjoyed a longer and better reign as Intercontinental champ for the Dragon. As a kid I would have marked out over a Hogan-Steamboat match. And I think it would have been a great draw. But back then we didn't get face vs. face. Hogan had some monster or giant or larger than life character to overcome when it came to title defenses. Rarely did he face an actual wrestler. Owen Hart is my pick from the 90's on this list. And I really think had he not died so young, he would have won the world title. 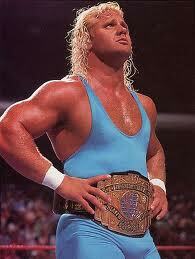 On the night of his death, he (as the Blue Blazer) was set to regain the Intercontinental title. I think that would have put the ball into motion to get Owen on the road to the title picture. Maybe not as Owen Hart, but as the man behind the mask, it was him doing the work. Owen earned his stripes during his feud with Bret in 1994. His pinfall win over him at Wrestlemania 10 proved he was for real. Winning the King of the Ring tournament later that year should have taken him to into the title picture much faster. Several past kings went on to win the gold. "Rowdy" Roddy Piper may have been the best heel in the WWF in the 1980's in terms of character. He took it to Hogan on the mic and in the ring. Fans truly hated him and loved to see him get beat up. And that's just what they got. But if you look back, I don't know that Hogan even actually pinned Piper like he did with the rest of his opponents. 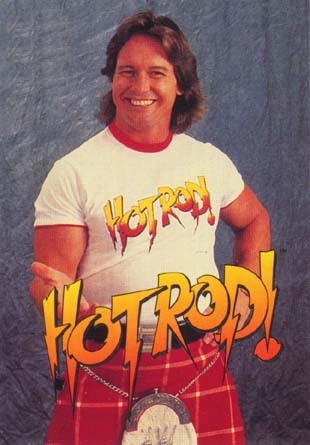 Again, I think it was more about the marketing and the physical size of the competitors back then that held Piper back. Then when he came back from his first retirement in 1989, the Ultimate Warrior was on the fast track to the top. But if you would have fast forward to today, he would have been one of the top guys in the company. His rivalry with Hogan makes the Cena-Orton feud pale in comparison. And there's always the Hogan factor. Back then I think (I'm just basing this on what I've read) guys like Hogan would refuse to drop the title and because of their star power, that was acceptable. To bad, because I think there could have been some great back and forth title swaps with Piper and Hogan. Honorable mentions: I can't end this list here. I had a lot of guys in mind when I came up with it. Jake "the Snake" Roberts, Davey Boy Smith, "Ravishing" Rick Rude, "Mr. Wonderful" Paul Orndorff, and "The Model" Rick Martel would round out my personal top 10. All these guys had an "it" factor that in this day and age would have seen them with at least one title reign in the WWE. I'd like to know who's on your list.